For something formed by the iron hand of physics, the universe has a lovely aesthetic sense  its galaxies spiral, its novas explode, its nebuale spread like great, sculpted clouds. For sheer cosmic delicacy, however, few things can touch the planetary ring. Neptune has one, Uranus has one, and Saturn, of course, has a braided, nested collection of them. Now, a less well-known ring around an otherwise unremarkable star is providing a new way to find Earth-like planets beyond our own solar system. There are three principal ways to detect exoplanets, each more challenging than the other. There's direct detection, of course  spotting the distant world with either a visible or infrared telescope. There's stellar occultation  watching for the flicker of light from a star as a planet passes in front of it. This is the method the Kepler space telescope has used to detect more than 2,300 confirmed or suspected exoplanets. And there's the even less direct gravitational wobble method: looking for the slight tug an orbiting planet exerts on its parent star as it travels around it. Now, a report accepted for publication by Astrophysical Journal Letters offers a fourth method, developed through observations of the nearby star Formalhaut. In 2004, the Hubble Space telescope revealed that Formalhaut has a large dust ring, thought to be a leftover from the formation of the star itself, a mere 200 million years ago (our Sun, by contrast, is closer to 5 billion years old). When Hubble snapped a photo of the ring, it became clear that the belt of dust had a surprisingly sharp inner edge. It was also positioned somewhat assymetrically around the star, rather than perfectly centered on it. "The best explanation," says Aaron Boley, a postdoctoral fellow at the University of Florida and the lead author of the new paper, "was that a planet was sculpting it." This is a well-known phenomenon in our own Solar System, observes Eric Ford, a University of Florida astronomer who co-authored the report. For example, he says, Uranus's epsilon ring is shepherded by two of its moons, Cordelia and Ophelia, while Saturn's F-ring is held in place by the moons Pandora and Prometheus. Sure enough, after a search with the Hubble by Berkeley astronomer Paul Kalas, the planet appeared to show up as a glowing dot of light, estimated to weigh in at three times the mass of Jupiter. That sighting turned out to be a mere illusion, however, after the Spitzer Space Telescope took a look and found nothing  something that shouldn't have happened since in this case, the Spitzer's infrared eye would be more sensitive than the Hubble. Still, failing to prove the existence of a shepherding planet is not the same as disproving it, so Boley and his colleagues decided to take a closer look, with the help of the giant new Atacama Large Millimeter Array (ALMA) radio telescope in the mountains of Chile. Though the telescope isn't in space, at more than 16,000 ft. (4,900 m) up, it's nearly as close as an Earth-based observatory can get. The $1.3-billion, internationally funded ALMA will ultimately consist of 66 radio antennae, working in unison to simulate a single, gigantic dish. It's still under construction though, so the astronomers used just 15. That, however, was more than enough to reveal that not only does the ring have a sharp inner edge, but a sharp outer edge as well. "If there was just one planet," says Boley, "how could this be?" It could be happenstance, he says. "I don't like that explanation, but it's possible." Another possibility is that a passing star happened to sharpen the outer edge as it went by. "But that's really hard to do and keep the ring as thin as it is." In the end, the team ran simulations to figure out the most probable cause of the ring's tight shape. The conclusion: a Super Earth, bigger than Earth but smaller than Neptune, on the inside of the ring, and an object somewhere between the sizes of Earth and Mars on the outside. Neither planet would be even close to visible with today's technology. That's not the end of the mystery, however. 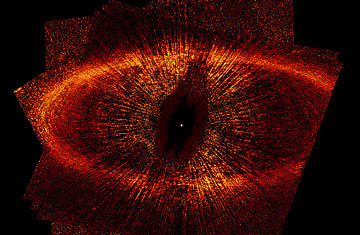 The ring itself is about 140 times as far from Fomalhaut as Earth is from the Sun, which puts the inner world at about 120 times the Earth-Sun distance and the outer planet at about 150 or 160. According to planetary-formation theory, though, it's hard to build planets at such enormous distances (in our Solar System, Pluto swings between 30 and 50 times the Earth-Sun distance). So how did they get there? As it happens, theorists faced a similar problem when the first exoplanets were discovered in the mid-1990's, except these were much too close to their stars. The explanation they came up with: the planets interacted with the stars' disks of dust and gas gravitationally, which forced them inward. The same sort of interaction, says Boley, could have pushed these planets outward. But, he cautions, "this is still an active area of research." In short, that explanation could turn out to be completely wrong, and some dark-horse idea could still emerge. In exoplanetology, says Boley, "things now seem possible that once seemed ridiculous." And given how young the science is, that trend is likely to continue.